Karen Woodward: Stephen King on Ray Bradbury: The sound I hear today is the thunder of a giant's footsteps fading away. Stephen King on Ray Bradbury: The sound I hear today is the thunder of a giant's footsteps fading away. The tributes to Ray Bradbury keep coming. The sound I hear today is the thunder of a giant's footsteps fading away. But the novels and stories remain, in all their resonance and strange beauty. I'm writing something now. But I wanted to put this up. I wrote it a couple of years ago as an introduction to the PS edition of The Machineries of Joy and it was reprinted in the Times. If you want to quote me, you can take anything you like from this, and add that he was kind, and gentle, and always filled with enthusiasm, and that the landscape of the world we live in would have been diminished if we had not had him in our world. And that I am so glad that I knew him. 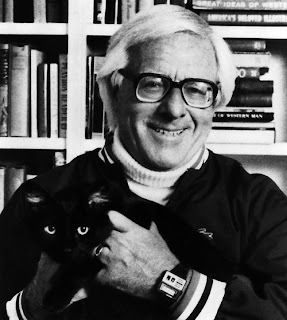 Last week, at dinner, a friend told me that when he was a boy of 11 or 12 he met Ray Bradbury. When Bradbury found out that he wanted to be a writer, he invited him to his office and spent half a day telling him the important stuff: if you want to be a writer, you have to write. Every day. Whether you feel like it or not. That you can't write one book and stop. That it's work, but the best kind of work. My friend grew up to be a writer, the kind who writes and supports himself through writing. Ray Bradbury was the kind of person who would give half a day to a kid who wanted to be a writer when he grew up. He was my muse for the better part of my sci-fi career. ... He lives on through his legion of fans. In the world of science fiction and fantasy and imagination he is immortal. His gift for storytelling reshaped our culture and expanded our world. But Ray also understood that our imaginations could be used as a tool for better understanding, a vehicle for change, and an expression of our most cherished values. There is no doubt that Ray will continue to inspire many more generations with his writing.